This handcrafted glass has been designed by Astrid Luglio with the aim of amplifying the olfactory perception during food tasting. The morphology of the glass enhances the aroma bouquet, while the beak allows you to taste the liquid till the last drop. 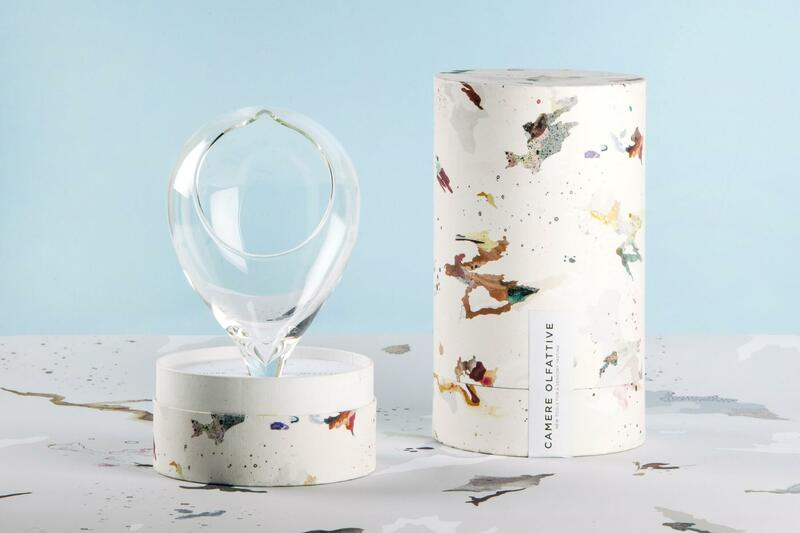 Camere Olfattive opens a time-space gap, allowing the user to smell unknown scents with their eyes closed, in order to experience and build a personal olfactory archive. My concept of the packing stemmed from the idea of actual stains of food left on the tablecloth after a meal. By looking at the packaging of Camere Olfattive you notice of mock drops of balsamaic vinegar, atomized oil, wine and whisky stains.